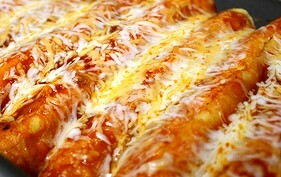 Traditional Mexican cheese enchiladas for the whole family! How to make cheese enchiladas. Lightly fry each side of the tortilla, so that they can still be rolled. Mix the green chiles and cheese together. Mix the tomato paste, enchilada sauce, and diced onion together and add 3 tbsp. water and stir until smooth. Pour half of the sauce into the bottom of the pan. Start rolling the enchiladas, by adding approx. 2 tbsp. cheese in each tortilla. Arrange neatly in the baking pan. Top with the remaining sauce and then with the remaining cheese. Bake in the oven for 20 minutes or until cheese is melted and cooked through. Cheese enchiladas drenched in a mild ranchero sauce.